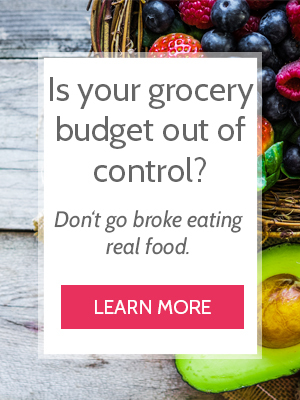 Real food recipes for under $1 a serving – If you have ever wondered how to eat real food on a tight budget, we made this for you. And it’s free for 3 days only! A few weeks ago, I went live on Instagram for the first time to share a Fridge Tour Friday – a peek into our mostly-real-food stash. I shared what exactly is in our fridge and freezer, and where we get the best prices to feed our family organic, local, real food for less than $2/serving ($1.42 to be exact). However, the truth is that for many years, we fed our family on less than $1 per serving. We still ate well, and we ate real food. Many of us struggle to eat well on tight budgets. But we don’t have to! I took my recipes and methods and compiled them into a 50-page eBook, called Dinner for a Dollar. Get the book FREE for 3 days only during launch week (starting September 16)! If you want to be the FIRST to know when the books is available and where you can find it, get on the list here. *Huge* Costco & Grocery Haul!